Likely we all, at one time or another, have stood in a park or nature preserve, surveyed our surroundings, and wished we had brought binoculars or a viewing scope with us. Are those lumps on a distant offshore rock in fact seals? What species is that bird, and what is it eating? 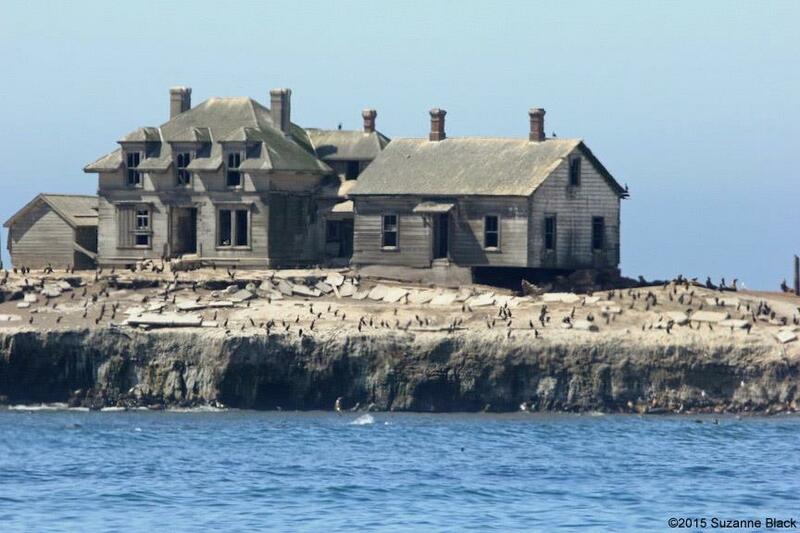 What’s out there on Año Nuevo Island? Island is in the distance. CSPA has for years paid for viewing scopes to be used by visitors at the observation decks where Docents can interpret what you are seeing.. Pictured at right is one of several such scopes that are used at Año Nuevo State Park. Ideally the scopes are optically powerful, physically rugged, waterproof, and won’t corrode or jam despite their frequent exposure to saltwater mist and blowing sand. They also need to be lightweight. An interpreter carries one or more plus their tripods or custom-made mounts to the viewing sites to set them up temporarily for the day. Satisfying all these requirements is a challenge. Visitors—and visiting school groups in particular—delight in looking through the scopes. The scopes endure a lot of use (not all of it gentle), and so on occasion they need to be repaired or replaced. It’s an ongoing problem for park staff to keep a sufficient number of functioning scopes available for use. It’s also an ongoing cost. Mike Merritt, Docent Coordinator at Año Nuevo State Park, proposed purchasing two “industrial-strength” telescopes designed for the harsh coastal environment and installing them permanently at one of the places of highest use: at the end of the equal-access boardwalk at Bight Beach. His recommen­dation was a twenty-power telescope that can be focused near and far. The field of view is 121 feet at 1000 yards, which as it happens is very nearly the distance from the boardwalk at Bight Beach to the nearest point on Año Nuevo Island. The image of the island at the end of this article was carefully calculated to simulate the telescope’s view via a camera and telephoto lens. The building in that image is the same as the one seen in the distance in the photo here of a boy using a current scope. You have probably seen these or similar telescopes at scenic viewpoints, and you even may have inserted one or more quarters and looked through one. Año Nuevo’s scopes won’t require coins. Visitors will generally be able to take their time—unless there’s a busload of school children waiting in line. This photo of Año Nuevo Island through a telescopic lens accurately simulates the view through one of the proposed telescopes from the boy’s position in the earlier photo. Mike presented his case, and CSPA’s board agreed to initiate a fundraising campaign to purchase them. As shown in the photo at left, the dual mount has one telescope at a height suitable for a standing adult and the other at a height suitable for a child or a sitting adult. An important point, in keeping with the scopes’ location on the equal-access boardwalk, is that the horizontal arm of the lower scope’s mount is designed to accommodate a wheelchair below it. These scopes are much more expensive but will last much, much longer. To check on their reliability, Mike contacted the director of the Seymour Marine Discovery Center in Santa Cruz, where two telescopes of this model were installed in 2000. She told him that, with only a minor repair to one of them, they have performed like champs these past 15 years. Also, State Parks has the same model telescope in use at Rancho del Oso Visitor Center.